The afternoon starts with a minute’s silence for the pope, who died the night before. But that’s the last mark of respect we’ll be seeing today. It’s Sunday afternoon at a breeze-block gym in El Alto, the poverty-stricken slums that tower above downtown La Paz, Bolivia. Whole families sit ringside and grandmothers, dressed in traditional Cholita dress of flowing skirts and bowler hats, prepare to lob popcorn viciously at the losers. Welcome to lucha libre wrestling, the latest sports craze sweeping Bolivia. “Lucha libre was born in Mexico but it has developed a huge following in Bolivia since we first allowed women into the ring last year,” says the event’s ebullient organiser Juan Carlos Chavez. Bolivia has a tradition of ritual fighting (tinku), which brings together rival villages in the Potosi department for a symbolism-loaded scrap during the Fiesta de la Cruz. But this afternoon’s no-holds-barred grudge match takes tinku and gives it a twist of Big Daddy-style glamour. First is an all-male round to warm up the crowd. Luxor makes a dramatic entrance in a devil suit while his opponent, Picodo, dressed like a member of Slipknot, arrives to a chorus of the German industrial band, Ramstein. As the first blood of the day is drawn, a young mother lifts her baby onto her shoulders for a better view. As his opponent tumbles exhausted from the ring, a slight women steps forward from the crowd to land a cheeky blow to a particularly vulnerable area. As the afternoon progresses, the bouts get increasingly bloody with blows stronger than the whiff coming from the toilets. By late afternoon, the crowd has reached fever pitch for the first of the all-women rounds. With a cry of, “A la luche” (let’s fight), they take to the ring in spandex, boots and masks. As the bell rings, referee Barba Negra, a Grizzly Adams type with a flowing mullet, tries to bring a sense of order to a fight that is part WWF pantomime, part bloodfest. It’s probably the only wrestling match whereby the referee ends up taking an active role. When the wrestlers roll out of the ring, they just carry on fighting anyway. Back stage, the star turn, Satanica, is getting into costume. By day Jenny Almarez works in a La Paz supermarket, but tonight she will take to the ring wielding a flaming torch to the strains of Black Sabbath. “I came to watch and something just grabbed me. The wrestlers looked like film stars,” she says, finishing her Gothic make-up. Her opponent, Jennifer Two Faces, takes to the ring in a figure-hugging leotard and gold boots. After trading insults, they launch into a catfight involving hair pulling and the improvised use of a soiled nappy commandeered from the crowd. It makes the male bout look like a petty scrap at the local kindergarten. “I always go home covered in bruises,” smiles Jennifer, who is declared the winner after setting Satanica’s legs on fire. This story first appeared in the Weekend FT in 2005. Liked this? 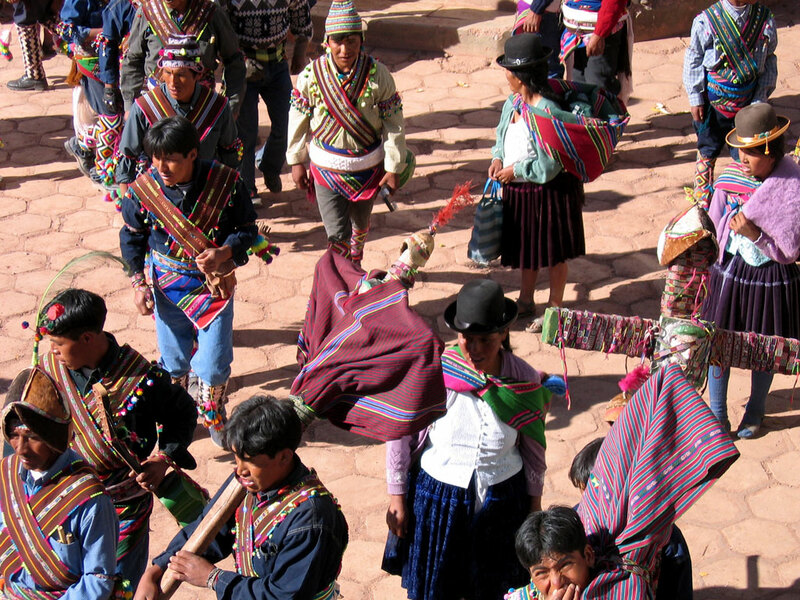 Try also The Tinku festival in Bolivia. Abdul probably has the best legs in La Paz. As he strides around the de facto Bolivian capital in his kilt – a tartan from the Steward clan borrowed from a Scottish friend – he attracts attention not only for unusual attire, but also for his finely-crafted calves. Then again, Abdul Aspiazu is not your typical 25-year-old Bolivian man about town. As the first Bolivian dance enthusiast to join the Las Paz Scottish Dancing Group three years back, he is now more likely to be found dancing a highland fling than salsa-ing the night away in a steamy Sopocachi nightspot. “I travelled around Scotland with my grandfather when I was 17 and fell in love with the Celtic culture: the music, the countryside, the whisky,” he smiles, adjusting his sporran. Every Saturday afternoon a 20-strong group of European ex-pats and local Bolivians gather at a ballet school near La Paz’s Plaza Espana for a two-hour dance session. With a shared love of Celtic music and a token contribution of five Bolivianos (about US$0.75), the group is growing fast. 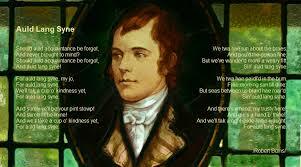 With Burns Night [pictured above] this weekend, the group will be out in force. “We have seen the Bolivian membership grow dramatically since the political turmoil of last year,” explains Valerie Mealla (nee Black), a native of Sterling, who leads the practice sessions. 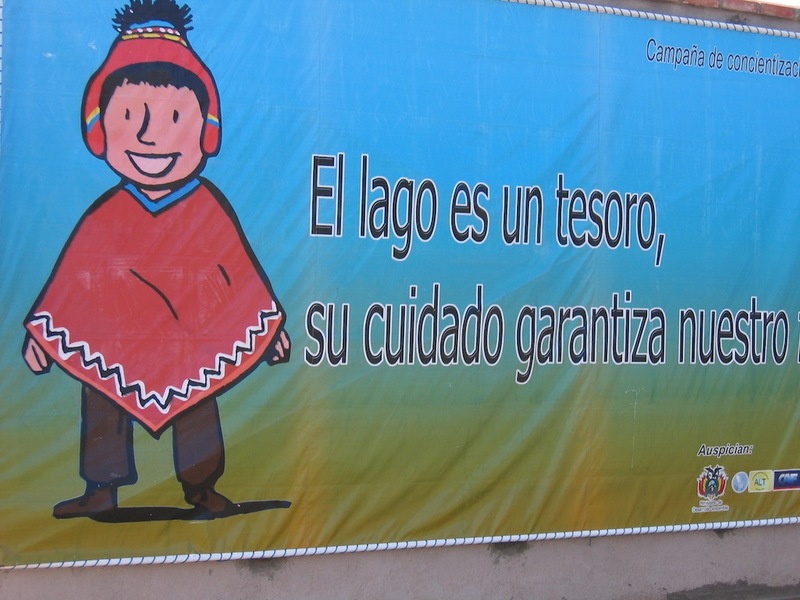 With anti-gringo feeling running rife since a popular uprising unceremoniously dumped the previous US-backed Bolivian president in October 2003, the social aspect of these weekly sessions provides a means to foster mutual understanding and tolerance between La Paz’s small foreign community and local Bolivians. It’s also tremendous exercise. Given that La Paz is one of the world’s highest cities at 3,600m, the sessions can bring a whole new meaning to ‘out of puff’, even for those well-prepared for the effects of altitude sickness. Regardless, the group last year broke the record for the world’s highest Scottish traditional dance, performing a Dalkeith Strathspey (a slow dance) at the Chacaltaya ski resort outside La Paz – an altitude of 5,260m above sea level. The Guinness Book of Records refused to acknowledge their achievement but, undeterred, the group is now planning a trip to the Scottish Highlands. “I like dancing and I like the music,” says the group’s youngest member, eight-year-old Erika Guerra of La Paz’s Miraflores district. Back on the dancefloor, the group are attempting a Burns Hornpipe routine. Valerie shakes her head wearily: there’s a lot of practice needed before the group is ready for its next performance at an Anglo/Bolivian fiesta. After practice, as night temperatures plunge across the Bolivian Altiplano, the members bid their farewells in a mix of English and Spanish. Abdul pulls on his boots and strides out into the La Paz night. “We all take the dancing and the traditions of Scotland very seriously,” he winks, sinewy calves glistening in the moonlight. This article was first published in the Weekend FT in January 2004. Liked this? Try also In the footsteps of Che Guevara in Bolivia. * Carnival season is kicking in but I’m trawling the back catalogue this week for an alternative to the average fiesta. Follow me on Twitter, or subscribe to the RSS, for weekly updates from my travel-writing archive in the months to come. The journey starts with a shot of local moonshine. In between it features an ancient festival to honour Pachamama, the earth goddess; vast, Andean landscapes; and a huge, alcohol-fuelled punch up. This is the strange world of tinku, a highly ritualised folk ceremony held in Bolivia’s rural Potosi region during the harsh Andean winter. Tinku means ‘encounter’ in the indigenous Quechua tongue and Bolivia’s most dramatic fiesta is essentially a harvest festival, celebrating the end of the agricultural year. What makes it stand out, however, is the colourful clash of Catholic and Pagan beliefs, which draw on the ancient rituals of Potosi’s indigenous communities. 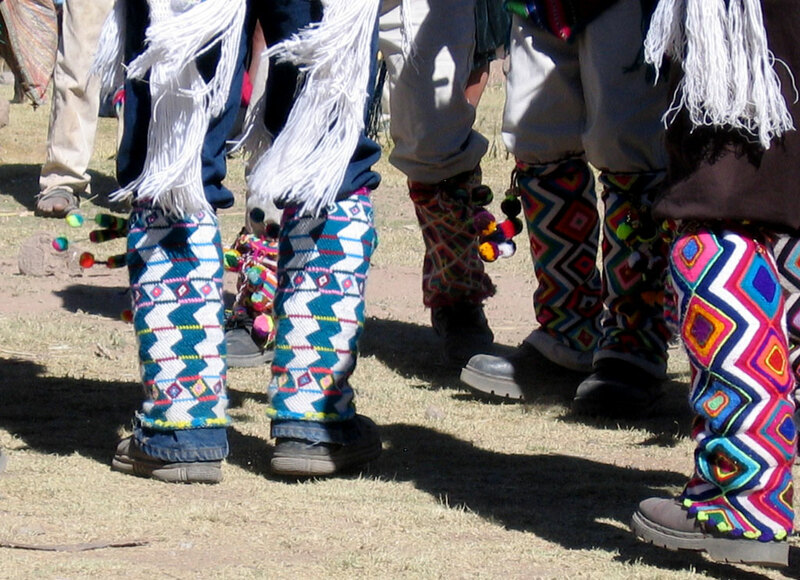 Five major tinku are held around Potosi annually with similar, smaller festivals taking place in remote highland communities. As the tinku builds to its violent crescendo, an offering to Pachamama is sealed in the spilling of human blood. Traditionally the villagers celebrating tinku have excluded tourists but, in the last couple of years, tour agencies in the city of Potosi, working with the local communities, have started offering tinku tours to witness the rituals of Andean communities that have changed little despite centuries of progress. The best known of all tinku is held each May in Macha, a 3,000-strong community of adobe houses, daubed with the slogans of local political parties, and dirt-track sidestreets, all built around a central plaza overlooked by a rough-stone church. Poor and remote, it sits astride the Andes at some 4,000m above sea level and is a six-hour drive north of Potosi by bus. I joined a small group of curious backpackers and amateur anthropologists with tour agency Koala Tours, setting out on a bright but chilly morning from Potosi. During the Spanish Conquest Potosi was awash with silver and noblemen, but today it’s a windswept place with a vaguely elegiac feel. Cerro Rico, the mountain that looms over the city, is a shadow of its former self, plundered over the centuries for the now-near-exhausted silver reserves. Before embarking on the trip, our guides makes a cha’lla, a ritual offering to Pachamama for luck on the road ahead, accompanied by a shot of chicha, the local maize-fermented hooch. The drink is as rough as the road that lies ahead. We rumble over crater-strewn tracks, stopping at a ramshackle hut by the roadside for a plate of soup with rice and potatoes and a last chance to stock up on biscuits and bottled water. Arriving in Macha at dusk, we find the town square bustling with a pre-tinku market. Stalls selling fruit sit next to men with ancient machines for sharpening knives and stitching shoes. Our guesthouse, meanwhile, is hardly five star: bleak dorm rooms with stained mattresses, a toilet block without doors and a loose hose gushing ice-cold water for a shower. By the time we are served a simple dinner of soup, rice and coffee, some of the group look to be already cursing their curiosity. After dinner we find Hernan Tarqui, the 33-year-old Catholic priest of Macha, sipping coca tea in a shabby house next to the church. The next morning we’re back on the bus, trundling out across vast, dusty plains. Dropped where the road dissipates, it’s then a 20-minute, cross-country yomp to the village Cruz de Machacamarca, where the first official day of tinku is in full effect. A tiny pueblo with llamas and dogs roaming free between the adobe huts, it is surrounded by a thin, red soil eroded from the surrounding hills. Village elders from the scattering of nearby rural communities, many dressed in costumes modeled on the Spanish conquistadors [see above], carry large crosses, carved with images of Christ, to a stark, white church to be blessed by the local priest. The rest of the villagers, meanwhile, are dressed in brightly coloured ceremonial clothes and whipping themselves into an early frenzy by swilling moonshine, dancing and indulging in isolated minor scuffles. Around the periphery, women and children huddle beside fires with bubbling vats of beans and corn. Some of the early victims, sporting black eyes and split lips, lay slumped by a stone wall. The carcass of a freshly sacrificed llama is being ransacked for the pot. We watch the dancing, keeping a judicious distance, but already the atmosphere feels tense as if building towards a dramatic climax. After the blessing of the crosses in the communities, rival villagers start to come together on the second day in Macha to dance, drink and settle their differences from the past year with bare fists. But this is not just some drunken brawl. Tradition dictates that spilt blood on the final day brings fertility to the rocky soil and a dead villager ensures an especially abundant harvest for the following year. The death often goes unreported, however, and is handled behind the closed doors of the community. Before that, in Macha’s sun-bleached town square, indigenous women, dressed in the traditional garb of long flowing skirts and embroidered shawls [see below], patrol the crowds with whips to administer a whiplash of community justice to anyone fighting dirty. The cow skin hats they wear are tough enough to withstand a sudden shower of stones and missiles from the crowd. Positioned on a balcony in the town hall, we can see how, as the afternoon gives way to evening and the shadows loom larger on the stone cobbles, the drinking and dancing is increasingly fervent. As rival factions charge drunkenly into each other, some lashing out with fists, the women build the rhythm, performing a shuffling, feet-stamping dance routine to the eerie strains of cane flutes and charangos, a mandolin-like Andean instrument. The chanting and goading intensifies with dancers engulfing the main square. The market traders continue to man their kiosks, interrupting commerce only to throw water over dancers stumbling into their wares. Meanwhile the dull thud of a CS Gas canister heralds the arrival of the local Police, trying to exert some influence over the crowd. But the dancers simply retreat to sidestreets to lick their wounds before relaunching themselves into the brawl. Darkness delivers the first serious casualties to Macha’s tiny hospital. Outside women are looking for their injured husbands while the ground is thick with blood and urine. Our guides have warned that us that, as guests, we should leave on the third and final morning of tinku to leave the community to complete the annual ritual away from the prying eyes of foreigners. As we climb into our sleeping bags in the guesthouse that night, the sound of rocks crashing off the roof lulls us to sleep. But before bed, we go in search of Father Hernan one last time. He will be staying up all night and shakes his head wearily as we say our goodbyes. “Of course the Church opposes tinku. We want to see a coming together of communities to share their blessings,” he says, as an assistant arrives to tell him the church has been secured for the night. * This story was first published in Geographical magazine in 2007. Liked this? 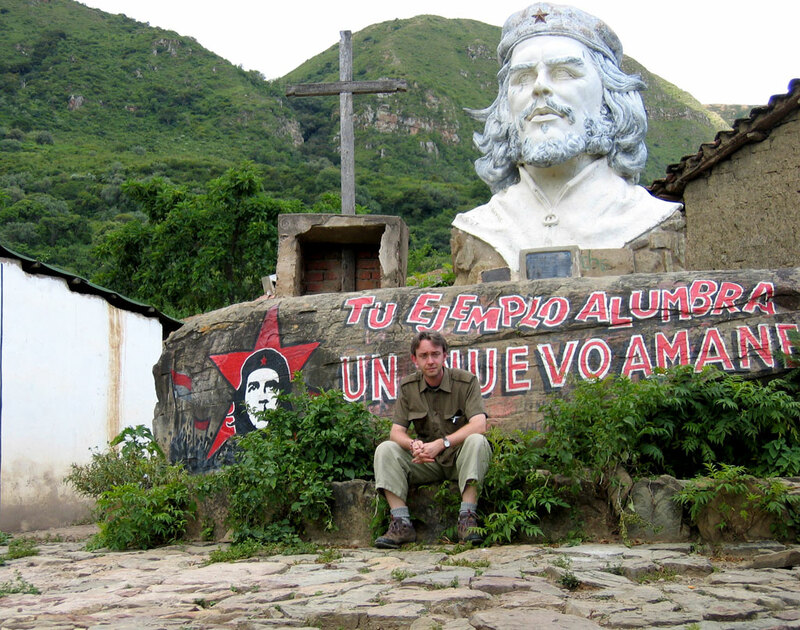 Try also In the footsteps of Che Guevara in Bolivia. * Delving back in the archive this week, here’s a story from my travels in South America on the trail of a rather famous fugitive. Follow me on Twitter or subscribe to the RSS for more story updates. Julia Cortes remembers the day clearly: October 8, 1967. She was a 19-year-old trainee teacher at the tiny schoolhouse in La Higuera, a remote and dusty pueblo lost amongst Bolivia’s eastern lowlands. When Bolivian troops commandeered the school as a makeshift prison for a wounded combatant, she was charged with bringing the prisoner food. Little did she know at that time, but that man was Che Guevara and she was to be one of the last people to see him alive. Che had travelled to Bolivia in November 1966 to mobilise a social revolution. Instead of liberating the rural underclass, however, the local community betrayed him and, after being wounded in a gun battle, he was captured by Bolivian troops. Then next morning, when Julia returned with his breakfast, the soldiers had already executed him. His lifeless body was taken to the Señor de Malta Hospital in the nearby town of Vallegrande, where the corpse was paraded before the world’s media. The bodies of Che and his follow guerrillas were then secretly dumped in unmarked graves. Che’s corpse was only unearthed and finally returned to Cuba for burial in 1997. Until recently, following in Che’s final footsteps entailed running the gauntlet of lost-in-time settlements and rough, dirt-track roads. But the inauguration of an official Che route, has opened up the region to a fledgling backpacker trail, fuelled by interest in the cult of Che with films like The Motorcycle Diaries and the forthcoming Che biopic with Benicio Del Toro in the lead road. Backed by international NGOs, the trail aims to generate vital income for the indigenous community in what is one of the poorest rural areas of Bolivia. Under the auspices of the project, the local Guarani people are employment in cultural projects, improving the services available to tourists and as official trail guides, charged with explaining events at various stages of the trail. The organisers sought the support of Che’s daughter in Cuba to rubber-stamp the initiative. There are, in fact, three routes through Che country, all retracing journeys as documented in his final tome, Bolivian Dairy. Of the three, the northern trail that runs from Santa Cruz de la Sierra, the economic powerhouse city of southern Bolivia, via Vallegrande to La Higuera, is the most accessible. Tour operators in Santa Cruz will arrange three to five-day itineraries by jeep, or independent travellers can catch bone-shaking local transport as far as Vallegrande, after which a 4WD will be required due to the perilous state of the roads. Along the trail, the scenery changes rapidly from lush, tropical vegetation to a rough scrub, dotted only with cacti and the occasional roaming mule. The route is marked by a combination of roadside panels and ceramic tiles while the Argentina artist, Rodolfo Saavedra, was commissioned to paint a selection of Che-inspired murals at key locations prior to the official launch. Vallegrande remains the best place to overnight along the trail. Standards are basic but functional with simple B&B-style lodgings and cheap but cheerful restaurants for a hearty set lunch. The town’s Casa de Cultura, set amongst the sun-bleached facades of colonial buildings fringing the verdant main square, is home to a striking collection of black-and-white photographs that bring to life the tumultuous events of Che’s last stand. Across town at the Señor de Malta Hospital, the laundry outhouse where journalists snapped images of Che’s corpse is starting to resemble Jim Morrison’s grave in Paris’ Pere-Lachaise cemetery as a site of international pilgrimage. The burgeoning graffiti collection from across the world features a mix of revolutionary slogans and emotional tributes. La Higuera, two hours heading southwest along the trail, is dominated by an imposing stone-carved bust of Che [pictured above], erected in 1997 to mark the 30th anniversary of his death. The schoolhouse is the Holy Grail for steady ant trail of Che pilgrims but remains virtually unchanged from the fateful day of his capture. As the sun blisters the scrubland and the mules seek shade under towering cacti, the local Che guide unlocks the schoolhouse door for me to gaze upon snatches of revolutionary slogans daubed like blood stains across the faded walls. I spend a few moments soaking up the silence. As I make to leave, one particular inscription catches my eye. * This story was first published in BBC History magazine in 2008. Liked this? Try An eco-escape in the Bolivian Amazon.